A big portion of luck led to Khao Sok National Park being the wonderful place we can explore today. Had it not been for a deadly epidemic in the 1940s and communist insurgency groups in the 1970s, there might not be much virgin forest left in the area by now. 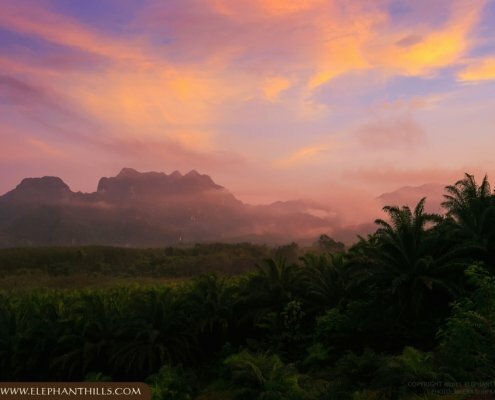 But flora and fauna of Khao Sok were fortunate enough to remain largely untouched, until the region was finally declared a national park in 1980. Since then a lot of people in the area have gone to great lengths to protect and care for the beautiful nature in this part of Southern Thailand. The erosion of the Shan-Thai landmass resulted in the deposition of sediments and pebbles into a large river delta system. Periodically these deposits would slide down the basin edge and into the sea. Over a period of millions of years the sea became shallower and thus warmer which resulted in good conditions for coral and other marine organisms to populate the area. Limestone (calcium carbonate) deposits began to form as the marine life established a coral reef that is said to have been five times the length of the Great Barrier Reef in Australia, stretching from China to Borneo. This is the reason Khao Sok and Krabi (Thailand), Guilin (China) and Halong Bay (Vietnam) and Sarawak (Borneo) have such similar topographies. The Karoo Ice age between 350 and 260 million years ago led to rising sea levels as a result of melting ice. Coral reefs were growing keeping pace with the water surface. Eventually, the marine ecosystem was buried under another layer of sediments (the end of the ice age meant increasing rainfalls and thus increases in erosion/sedimentation). The resulting high pressure from being buried under hundreds of metres of sediments resulted in the formation of the limestone rocks we can see here today. Granite in the form of huge magmatic bodies intruded into the limestone rocks that were still buried deep under the sea. These molten granite intrusions underwent a chemical reaction with the sedimentary rocks forming deposits of tungsten and tin. The Indian plate collided with the Eurasian plate, forming the Himalayas and causing the landmass of Thailand to rotate clockwise and move south east. The limestone, sandstone and granitic rocks were uplifted, folded and faulted, exposing them to erosion by rain and river waters. The limestone rocks have been partially eroded by acidified water (resulting from the rain water flowing through the rainforest leaf litter) creating the beautiful karst formations we see here today. There is evidence of human presence on Borneo between 37 000 and 50 000 years ago. The last ice age ended about 10 000 years ago, meaning there could have been migration (by land) from Borneo to Thailand during the period of the ice age. Certainly, the habitat in both locations was similar enough to support these people. There is also biological evidence. For example, the bamboo species Gigantochloa balui is normally only found in cultivated areas on Borneo – never truly wild, yet this species has been discovered growing wild on the Thai peninsula. It is highly unlikely that this species moved between these countries without being carried by humans. The first accounts of people living in Khao Sok date back to the reign of King Rama II, when the Burmese attacked south western coastal towns and many local people fled into the jungle for safety. As news spread that the region was rich in animal life, had fertile fluvial soils and good rainfall, more people came to the region. A deadly epidemic swept through the region killing a large number of the population, those who survived moved away from the area. The village that was now deserted became known as “Ban Sop” – which means “Village of the Dead”. 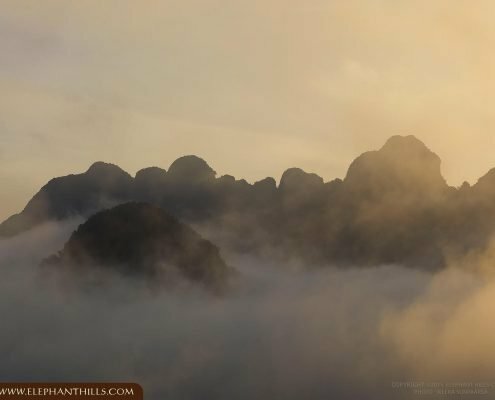 However, this is only one explanation for the village’s name which might also be derived from the name of a mountain called “Khao Sop” or “Corpse Mountain” being located close to the village. Road 401 was constructed between Phun Pin (Surat Thani) and Takuapa (Phangnga). This opened up the whole area for settlements and plantations and alongside with them for modern weapons and tools causing trouble for the nature in the area. The logging and mining (tungsten and tin) industry soon followed at the cost of the rainforest and the Sok river. The water in this river changed its colour to brown due to sediment runoff as a result of the soil erosion caused by the logging and mining industry. Thai students, who had joined communist insurgency groups, set up a stronghold in Khao Sok, since it was the ideal territory to hide and operate guerilla warfare. Between 1975 and 1982 these students not only kept the Thai Army at bay, but also kept the loggers, miners and hunters out. Had it not been for this seven year occupation, Khao Sok’s forests may well have gone the same way as much of the rest of Thailand’s wilderness: up in smoke. Also during this period there was considerable interest from the government and the Electricity Generating Authority of Thailand (EGAT), because research had shown Khao Sok to be the largest watershed in southern Thailand. The National Park Division also carried out some research and established that there was still considerable biodiversity worth protecting in the region. 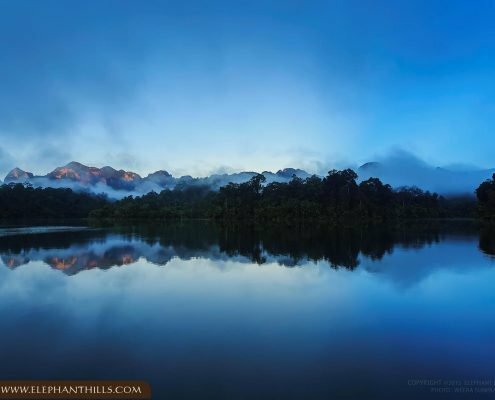 Khao Sok National Park was officially established. EGAT erected the Rajjaprabha Dam, closing off the Pasaeng river and creating a 165 square kilometer lake inside the boundaries of the National Park, the Cheow Larn Lake. This dam was built to guarantee a source of electricity to the south of Thailand, which by now had become a major holiday destination. EGAT attempted the largest ever capture and release operation of animals in Thailand to save animals facing drowning in the lake. Unfortunately, this operation was largely unsuccessful and many of the species captured died from stress. A World Bank study in 1995 revealed the loss of some 52 species of fish which were not able to adapt to the deep waters of the lake. Today, Cheow Larn Lake is probably Thailand’s most wonderful freshwater lake and attracts a good number of visitors every year. Visiting on a daytrip or even staying overnight in one of the few floating raft houses is highly recommend when visiting Khao Sok! For information on how to best explore Cheow Larn Lake, please feel free to take a look at our recommended tours.